Never sacrificing form for heavy weight is like saying “quality over quantity.” As a society, we tend to recognize our success with numbers. This is also true in the weight room. Big numbers mean that you must be a good lifter. However, big numbers in the weight room only measure one thing. In an unsupervised training session, there usually isn’t as much attention to how well you complete the lift. 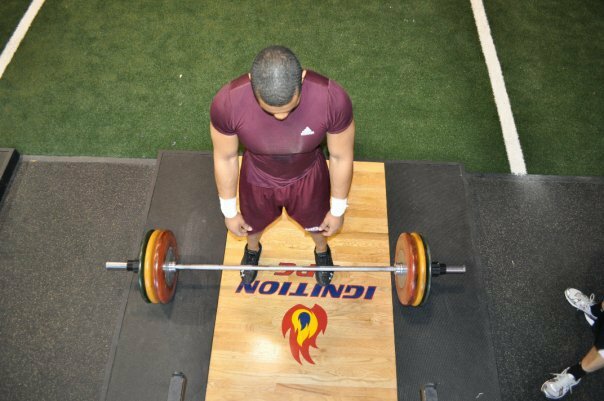 For a lot of people, deadlifting 400 lbs looks great on a strength card or piece of paper, but what if the form of the deadlift consisted of a rounded back and the knees locked before the shoulders came up? Then this person most likely shouldn’t be deadlifting 400 lbs. Making sure that the quality of the movement is mastered before actually training the movement can be the difference between performance enhancement and injury. Jumping weight too quickly and letting form break down will do way more damage than good. It starts with the assessment of the athlete and how they move before the onset of activity. We use the FMS (Functional Movement Screen) with some of our athletes to get to know what their movement patterns are like right off the bat. You can get to know a lot about your athlete by just learning how they move. There are even things to learn about an athlete’s warm up and their quality of movement and/or stability. Assessing athletes at the beginning of their first session will not only give you valuable information about their developmental level and movement patterns, but it also gives you a chance to get to know your athlete. After assessing that the athlete has the mobility and stability to perform the exercise, it comes down to discipline and accountability that the athlete is maintaining proper form and technique. For example, we stay with relatively light weight for Olympic lifts so that the emphasis is not on the weight itself, but on the speed and quality of the movement. Numerical goals are still very important to set in the weight room. Along with feeling stronger, it is important and motivating for athletes to see their numbers going up. However, there is a time and place for that. Once the movement is learned and there are no limitations that increase the risk of injury - train it and set goals. Never sacrifice form for heavy weight. Train hard, train smart.